Democrats have always liked to run veteran candidates. It allows them to sidestep accusations that they are “weak on defense.” Public confidence in the military remains high, and as Trump attacks Democrats, the strategy allows candidates to point to a nonpartisan record of government service. On Tuesday night, the strategy was met with mixed success. With Honor, a bipartisan political action committee, tracked 199 veterans from both parties running for the House. According to a review by The Intercept, 38 of those were races where single Democratic candidates were challenging Republican incumbents. In several races, multiple Democrats were on the ballot and split the vote; those are not included in The Intercept’s count. Out of the 38 veteran candidates, only five won — Jason Crow in Colorado’s 6th District; Mikie Sherrill in New Jersey’s 11th District; Max Rose in New York’s 11th District; Chrissy Houlahan in Pennsylvania’s 6th District; and Elaine Luria in Virginia’s 2nd District. When including intelligence veterans like Spanberger and Slotkin, that number goes up to seven. And when including former Obama National Security Council official Andy Kim who declared victory Wednesday in a tight race in New Jersey’s 3rd District, the tally rises to eight out of 42. Put another way, out of 24 Republicans unseated by Democrats, a third were unseated by veterans and former national security officials. 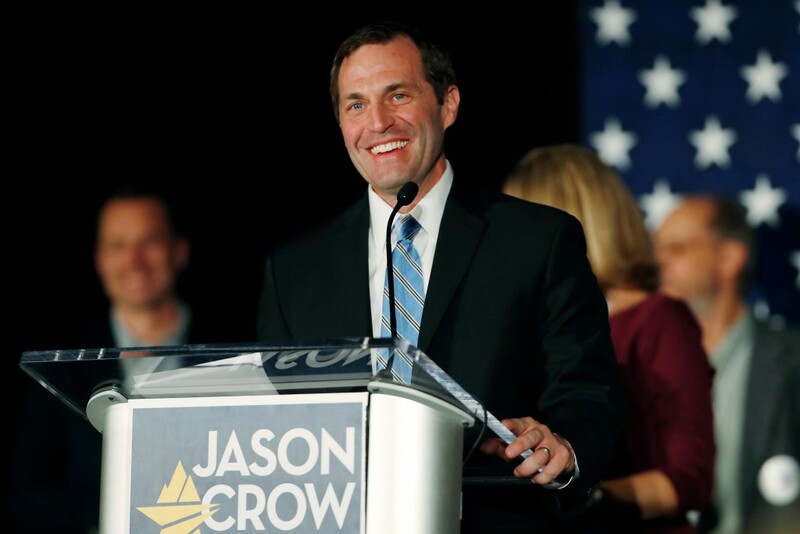 Jason Crow, Democratic candidate for U.S. House seat in Colorado’s Sixth Congressional District, addresses supporters at an election night watch party in Greenwood Village, Colo., on Nov. 6, 2018. Those numbers alone don’t say much about whether the DCCC’s strategy succeeded or failed. Keep in mind that it was a strategy to flip right-leaning districts, where Republicans, and particularly Republican incumbents, have an advantage. So a high failure rate isn’t surprising. More than 15 of those 42 districts are rated by the Cook Political Report at more than R+10, meaning that an average election would swing to a Republican by 20 points. And the strategy did succeed in flipping right-leaning districts: Of the eight seats won by former national security officials, six leaned conservative. In some races, Democrats were running against incumbents with national security experience. Luria, a former Navy commander, edged out former Navy SEAL and Republican Scott Taylor in Virginia; and in Texas, a battle between two former intelligence officers, incumbent Will Hurd and Gina Ortiz-Jones, saw Hurd appearing to beat his Democratic opponent. In many of those races, government experience took a backseat to health care, with Democrats stressing that their plans will guarantee care to people with pre-existing conditions. And at the end of the day, it’s difficult to control for talent. In the cases of Slotkin and Spanberger, both were politically talented and well-resourced in a field often dominated by local officials. Spanberger’s viral closing argument in her debate against Republican Dave Brat likely tipped the scales in her favor. But in some cases, the DCCC spent big on candidates who didn’t end up winning. The DCCC spent almost $1.7 million backing Dan Feehan, a former Army soldier and acting assistant defense secretary, and another $2.1 million on ads against his Republican opponent in a conservative-leaning district. Media reports project that Feehan lost by about 1,300 votes, though he has not yet conceded. The post Democrats Encouraged Military Veterans to Run in Midterms. The Results Were Mixed. appeared first on The Intercept. This entry was posted in News by Alex Emmons. Bookmark the permalink.